Intrinsic structure of amorphous polymers is highly disorder with long molecular chains entangled with each other. They are usually considered as thermal insulator due to their ultra-low thermal conductivity. One effective way to improve the thermal conductivity of amorphous polymers is modulating the chain conformation by external field, such as stretching force and electric field. Electrospinning serves as an effective way to control the chain conformation. High electric voltage and stretching force act on the jet during the fiber formation process. Therefore, the molecular chains tend to align along the fiber axis and be less entangled. It has been observed that thinner nanofibers tend to possess higher thermal conductivity as Figure 1(a) shown. 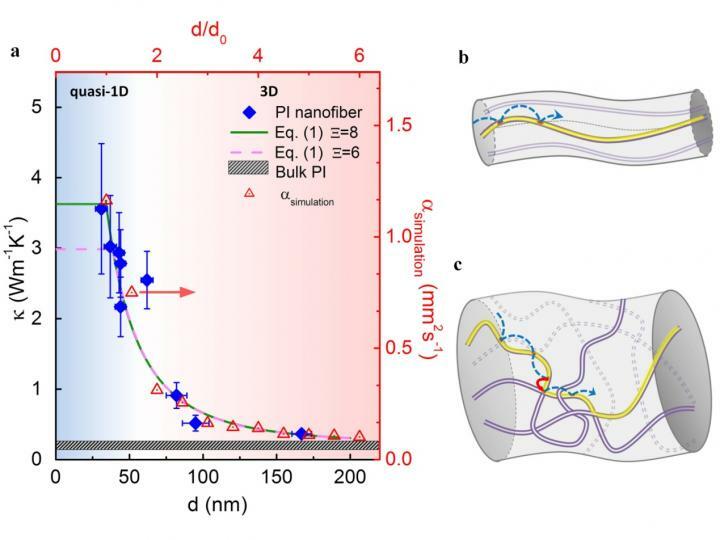 Nanofibers with diameter larger than 150 nm possess thermal conductivity similar to bulk polymers, while the thermal conductivity of nanofibers with diameter smaller than 50 nm reaches an order of magnitude larger than that of bulk polyimide. One long-standing problem is how the chain conformation influences the thermal conductivity. The paper distinguishes the heat transport within the chain and between different chains. The intra-chain heat transport should be more effective than inter-chain heat transport due to the stronger intra-chain covalent bond than inter-chain Van der Walls interaction. Supposing the heat carries undergo a random walk in the molecular chains, the thermal diffusivity is corresponded to different chain conformations. In ultra-thin polymer nanofibers (Figure 1(b)), all the molecular chains are oriented along the fiber axis, thus the heat carriers could only move forward or backward within the molecular chain along the fiber axis, leading to the upper limit of thermal conductivity. Things are totally different in bulk-like polymers (Figure 1(c)): first, the molecular chains are gyrated that the heat carries could 'walk' along directions other than the fiber axis; second, heat carriers have chance to 'jump' to another chain at some sites when two chains interact with each other. In other words, heat carriers in bulk polymers undergo many invalid 'steps' for thermal diffusivity along the desired direction. In order to describe the diameter dependence of chain conformation, an empirical function is proposed and explains well the experiment results. Although the real network structure of molecular chains in amorphous polymers is not yet clear, further thermal conductivity models have to incorporate the unique chain structure of polymers and the difference between intra-chain and inter-chain heat transport. The paper concludes that a crossover of heat conduction from 3D to quasi-1D has been observed experimentally in amorphous polymer nanofibers obtained from electrospinning. The random walk theory for heat carriers successfully explains the diameter dependence of thermal conductivity.